The Australian Thai Chamber of Commerce coordinated arrangements for the design, construction and maintenance of a memorial along an abandoned section of the route of the railway line constructed by the Imperial Japanese Army in 1942 43 between Burma and Thailand. These arrangements were conducted with the kind cooperation of the Government of Thailand, particularly the Armed Forces Development Command. The memorial complex is intended to honour the Allied Prisoners of War and conscripted people from India, Burma, Malaya and other countries who died during the construction of the railway, as well as all who suffered as a consequence of the hardships endured during the railway's construction. 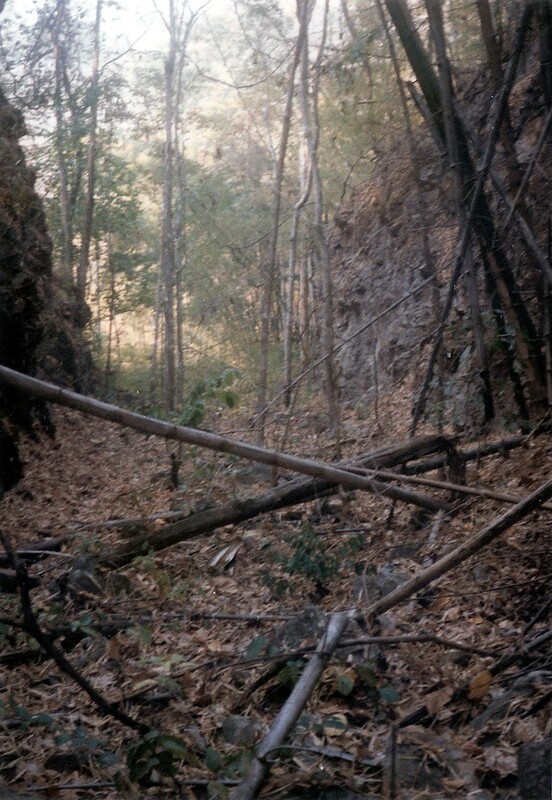 The original aim of the Project was to provide access pathways to Konyu Cutting at Hellfire Pass on the abandoned portion of the Thai Burma Railway. A Thai team conducted a detailed survey of the proposed route of the access pathways in October 1986, from which site plans were produced and approved in November 1986. Actual construction of the pathways commenced in early January 1987 and this was completed in mid March 1987. In April 1987 the Hellfire Pass Memorial Dedication Ceremony occurred with Sir Edward Dunlop making the dedication. To assist in the compiling of the wartime history of the area, a request for air photo coverage was made to the UK Ministry of Defence. Photos of excellent quality taken in December 1944 clearly show details of the railway together with roads and the remains of a camp at Konyu. A map was produced with sufficient detail to illustrate the important features of the area. Ken Bradley was the main contributor with advice from Bill Haskell. The Hellfire Pass Memorial Project was coordinated by the "Hellfire Pass Sub Committee" of the Australian-Thai Chamber of Commerce and it was the Chamber's main contribution to the Australian Bicentennial 1988 Programme in Thailand. The initial phase of the project was funded by a grant of A$31,000 from the Australian Government. The memorial concept became a reality under the leadership and guidance of Ken Bradley, who, through considerable devotion of time and energy, had been the mainstay of the project from inception to reality. Former PoW, Tom Morris, who originated the project concept, provided much essential background information, enthusiasm and encouragement during the establishment of the Memorial. Numerous other ex PoWs have made helpful contributions to documenting the history of the Hellfire Pass area. Special mention is due to Jim Appleby (Snowy Mountains Electricity Corporation) for initiating the Project and to his successors, notably Mike Power, for continuing to make outstanding contributions. Other important contributors were Colonel Lachie Thomson, former Defense Attaché at the Australian Embassy, and his counterpart at the British Embassy, Colonel Mike Allen, who succeeded in locating air photo coverage of the area. The Hellfire Pass Sub Committee received encouragement and support from a number of government officials. Early visitors to the site included H.E. Ambassador Richard Smith; Foreign Minister Bill Hayden; the Minister for Arts, Heritage and Environment Barry Cohen; and the Shadow Minister for Veterans' Affairs Tim Fischer. Following his visit, Tim Fischer drew attention to the Hellfire Pass Project in a speech to the Australian House of Representatives on 27 February 1987. Over the years the Australian armed forces have had exchange programs with the Thailand military. During some of these exchange visits Australian service personnel have visited Hellfire Pass to carry out work projects. One such visit took place in April 1989 when 33 members of 'C' Company 3rd Battalion, Royal Australian Regiment, spent three days carrying out maintenance work at the memorial site. Their toil culminated in the re laying of a single section of original rail and sleepers in Konyu Cutting. These rails were laid on 22nd April, almost 46 years to the day since excavation work began at Hellfire Pass. In June 1990, 26 sailors from HMAS Perth and HMAS Swan carried out further maintenance work. As with the other groups of Australian servicemen, the sentiments of this group were that it was indeed an honour to assist with the upkeep of the memorial. Exercise "Clear Trek" took a working party of some of the ship's company of HMAS Tobruk and some of the attached army personnel to Hellfire Pass in November 1990. Their aim was to clear the walking tracks of the ever-encroaching jungle and to make essential repairs to the timber stairways. October 1991 saw the demolition of the wooden stairway by members of the Western Australian based SAS Regiment and the start of work to replace them with concrete. This work was completed during December. At a service held on 4 February 1992 a monument featuring a bronze relief map of the area traversed by the railway and containing a time capsule was dedicated in the presence of a large gathering. The start of the wet season in 1993 again saw major army involvement at Hellfire Pass with troops of Base Squadron, SAS Regiment involved in Exercise Burma Rail 1993 carrying out a major clearing exercise in the cutting. In February of 1994 the entire length of Hellfire Pass and the access pathway were given a major cleaning prior to the visit by Mr Paul Keating, Prime Minister of Australia on 9th April. Later the same month a plaque honouring the medical personnel, who saved so many lives during the construction of the railway, was erected and dedicated during the service to inter the ashes of Sir Edward "Weary" Dunlop (12 Jul 1907 - 2 Jul 1993, age 85) on ANZAC Day 1994. Since that time the memorial has been kept clean by regular maintenance by Chamber of Commerce personnel on a voluntary basis. Also, during this time preliminary clearing and survey work was carried out northwards from Konyu Cutting along the route of the abandoned railway towards Hintok as a precursor to the establishment of a safe walking trail from Hellfire Pass to Compressor Cutting. As donated funds have become available, further major work has been carried out. In late 1994 to early 1995 the "Bamboo" trail which winds around the back of the mountain above Hellfire Pass was upgraded to a concrete walking path and stairways. Rod Beattie of the Thailand Burma Railway Centre and curator of the Kanchanaburi and Chunkai Cemeteries has been heavily involved over the years and the Australian-Thai Chamber of Commerce is extremely grateful for his tireless efforts. Major upgrading and improvements to the site have been funded by private and corporate donations, proceeds of sales of the Memorial booklet and the sale of slices of original rail bearing a small plaque. More recently funds have been raised by the sale of original rail "dog" spikes set in a piece of original sleeper carrying a small plaque. Additional funds have been raised by a Melbourne based group headed by Mr Bill Toon, a former prisoner of war and veteran of the Thailand Burma Railway. In May 1995, the Australian Government announced that it would provide funding (A$1.6 million) for the development of a substantial memorial complex at Hellfire Pass. This development was to be done over a period of two years and include development and construction of a museum/visitor information centre, construction of concrete stairways to provide a safe walking trail along the cleared section of abandoned railway northwards from Hellfire Pass construction of rest stations and information displays along the walking trail, improved road access and the construction of a car park adjacent to the museum/information centre. During 1995 and early 1996 more than four kilometres of the abandoned rail bed, from Hellfire Pass to Compressor Cutting was cleared of fifty years of jungle re-growth. Most of this work was done as a voluntary personal tribute by Rod Beattie and his wife Thuy to those men who worked and died building the Thailand Burma Railway. Subsequently a further four kilometres was also cleared. This length is probably the longest continuous section of wartime railway still in existence in Thailand and contains probably the greatest concentration of major works of the railway. During the clearing of the railway many wartime relics were uncovered. Small items, such as rock drills used for drilling blast holes, steelwork from trestle bridges, items from the telephone line and debris from the air raids may eventually be displayed in the museum. More substantial features such as the narrow-gauge rail track, used to carry spoil away from some of the larger cuttings, have been or may be reconstructed in their original positions. Early in 1996, when the government funding became available, construction of the permanent improvements began. Initially this was the work involved in making the walking trail safe and fairly easily negotiable for visitors. Concrete stairways were built over all difficult sections and a series of small covered rest stations were erected along the trail at significant locations. Information panels have subsequently been erected in each of these rest stations. A substantial rest station complete with toilets has been built at the junction of the abandoned railway and a local gravel road, close to the site of the former Hintok Railway Station. This rest station can be reached by vehicles, and provides a convenient pick up point for those walking the trail. The memorial walking trail was officially opened on ANZAC Day in 1996. The major element of the Hellfire Pass Memorial Project is undoubtedly the museum/visitor information centre. A structure of this nature is of two major components, the building itself, and the display within the building. A renowned firm of museum designers, Hewitt Design Associates, was commissioned to design the display element of the museum and the visitor information panels of the walking trail. A Bangkok based Australian firm of architects, Woods Bagot (Thailand), designed the building and prepared all of the necessary documents leading to the selection of a local contractor to build the museum. The memorial museum/information centre was opened by the Australian Prime Minister, Mr John Howard, on 24th April 1998. April 1990 ANZAC Day Dawn Service and Dedication for relaid rails. Dec 1994 Feb 1995 Reconstruction of "Bamboo Trail"
Places are still available on the QUIET LION TOUR 2019 which departs Perth on 19th April 2019 and returns on 30th April 2019. If you are considering taking part in this most interesting and informative tour you are advised to make a booking now. The political situation is stable, the new King settled in and the Military control accepted. No demonstrations are occurring nor are any expected. There are no health threats current and this is likely to remain over the period of the tour. The Quiet Lion Tours have always featured High School students from around Australia who are sponsored by various charitable and service organisations. The focus on students is to celebrate the work done by the Doctors on the railway and to perpetuate the message that “we may forgive but we will never forget” the horrific story of the Burma Thailand Railway. The tour normally includes survivors of the railway construction, but this is subject to the health of the POW’s and is not guaranteed. The Tour is for 11 days (10 nights) and the focus is on the story of the Australia PoWs, their camps and the Australian doctors culminating in the ANZAC Day Dawn Service in Hellfire Pass and the Memorial Service in the Cemetery at Kanchanaburi. Many sites of Prisoner of War camps, the Bridge on the River Kwai, hospital sites and other areas of interest are visited as part of the tour. Descendants of ex-POWs who have become authorities on the Thai Burma Railway travel on the tour and provide commentaries in addition to English speaking Thai Guides. The Quiet Lion Tours commenced in 1985 and travel to Thailand to honour Sir Edward “Weary” Dunlop, all other Doctors who tended the sick and all the Prisoners of War who were on the Burma Thailand Railway. The tours are operated by the Burma Thailand Railway Memorial Association, a non-profit group dedicated to preserving the memory of those who toiled on the Death Railway as Prisoners of War of the Japanese. Several days are spent in Bangkok for tourist, shopping opportunities and to acclimatise to the local weather conditions. Accommodation comprises of 3 nights at a top hotel in Bangkok, 1 night at a riverside resort in Kanchanaburi and 6 nights at the Home Phu Toey Resort (on the River Kwai near Hellfire Pass) which includes the Weary Dunlop Peace Park. Arrangements can be made for travel from any State in Australia. In the Case of Brisbane, the flights are via Sydney. Itinerary and associated information details are available on the BTRMA web site. See Booking Conditions on the BTRMA web site.